As some attentive users of Visual Complexity might have noticed, the number of projects featured on the website has slowly come to a halt, with the perpetual grand total of 777 being a grieving reminder of inactivity for well over a year. Today, If you go the the main page and look at the top right corner, you will see an invigorating new message: “Indexing 782 projects”. Of course I didn’t want to write this blog post to announce that five new projects have been added to the database. This recent addition is part of a larger plan I’ve been wanting to share with you for some time. In October 2015, Visual Complexity will celebrate its 10th Anniversary, a significant feat considering the life-span of many online projects, and an eerie memo that a long time has gone by since I launched the website after graduating from a MFA program at Parsons School of Design. In order to commemorate this event, I plan on reaching 1,000 projects by October next year. 1,000 projects in 10 years. As you can imagine, this is not an easy enterprise, so I’m relying immensely on Angela Zhou, a researcher and student at Princeton University, to help me gather and document many new additions to Visual Complexity. There might also be a small celebration, which I will announce closer to the date. But for now, be sure to watch for new projects being added to the website. 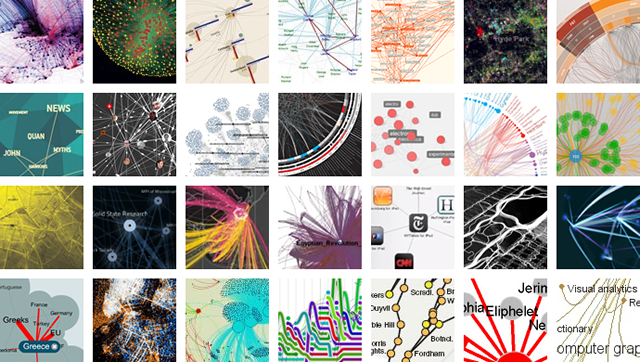 If you want to contribute to this ongoing research, please use the “Suggest a Project” form on the homepage, in order to recommend a new network visualization.